Did you know that something that is smaller than the palm of your hand can have a huge effect on a player’s tone, articulation, projection, and range? All of these things are completely possible to achieve by just changing one part of the instrument. That part is the mouthpiece. For trombone players, the mouthpiece is a crucial element of being able to play the instrument. Without it the instrument is nearly unplayable. The construction of a trombone mouthpiece consists of several different parts and many different kinds of variations depending on the players needs. On the mouthpiece there is the rim thickness, cup depth, cup diameter, rim diameter, throat, and the shank. Each of these parts has a different effect on the players sound. The rim thickness and the shape or contour of the rim has an effect on the comfort of the mouthpiece against your embouchure. The cup diameter and the cup depth each have an effect on the articulation, tone quality/color, and the range the player could achieve. The shank has an effect on the air flow through the instrument and has an effect on the color of the sound that you produce. For example I have played on a trombone mouthpiece that is a 6 ½ AL with a large shank and this mouthpiece worked for me but it did not do what I wanted it to. I went into the market looking for a mouthpiece to increase my tone quality, give me a better lower range (that was what I was specifically looking for in a mouthpiece), and to help me have a better articulation. From the 6 ½ AL I went to a Bach 5G mouthpiece again with a large shank because that was the kind of trombone that I was playing on. Once I played on the Bach 5G I instantly fell in love with the mouthpiece because it helped me to achieve all the desires I wanted out of the mouthpiece. When you are in the market for getting a new mouthpiece there are a couple questions you need to ask yourself. What kind of sound do I want to go for? Do you want to go for a sound that is dark and mellow or a sound that is bright? If you said that you want a sound that is dark and mellow then you want to look for a mouthpiece that has a deeper cup and a wider cup diameter. The deeper and wider cup will allow for your lips to vibrate a little more freely and allows for the air flow to have more depth to go through which then effects the sound to be darker in tone color. If you want to have a sound that is brighter then you want to have a cup that is not that deep (maybe even a 12c mouthpiece) or a cup diameter that is not quite as wide. What part do I want to play the most i.e. First, Second, Third, or bass? With each part it asks you to play in different registers of the instrument more than others. Which means you may want to have a mouthpiece that matches. For first parts they play in their upper register often so you want to have a mouthpiece that has a shallower cup where it will help you to play those higher notes more comfortably. The same with the others the third and bass bone parts ask the player to play in their lower register. With this you would want to have a mouthpiece with a deeper cup. How comfortable is this mouthpiece on my face? You may be wondering “why does this matter?” In actuality this is one of the important aspects of finding a new mouthpiece. If you have a mouthpiece that does not feel good on your face then, it is going to make your chops ware out much quicker than a mouthpiece that is comfortable. The rim thickness and even the plating of the mouthpiece will have an effect on the comfort and the endurance a player may have with their mouthpiece. This thickness is something that you will have to experiment with. It is typical that a gold plated mouthpiece allows for more endurance than a mouthpiece that is not gold plated. Gold is a much finer material than a silver plating and it is a lot “smoother” than a silver plating. You always should try out as many mouthpieces that you can and spend some time on them. 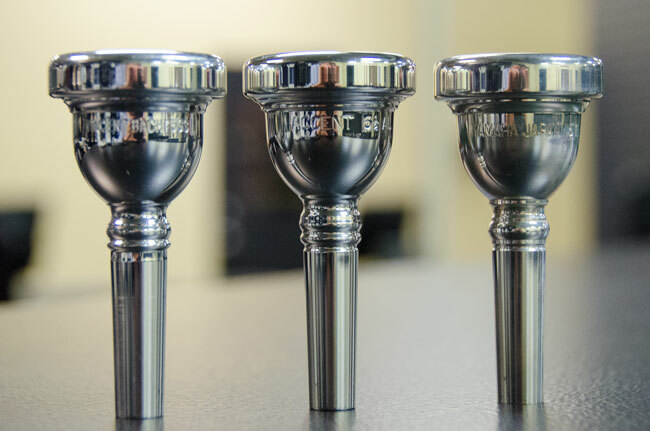 The time that you spend on the mouthpiece will help you to better understand the sound that you are producing and the benefits of upgrading your mouthpiece. If you are a student and you play on a student instrument you can improve your sound in one easy switch and I am not talking about switching your instrument but by switching your mouthpiece. One day you too will find the mouthpiece that you fall in love with!